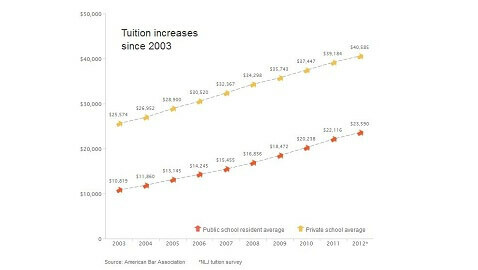 Our intuition about tuition suggests that when the number of law school applicants sharply decreases, so should the tuition. But this hasn’t been the case. Though the number of law students has plummeted 25 percent these last two years, tuition continues to nose up at 4 percent a year for private schools and 6 percent for public schools — while the inflation is only 1.7 percent. How much choice law schools have in the matter is another issue. A few universities stayed the same in their tuition, such as William S. Boyd School of Law at the University of Nevada, Los Angeles; The University of Colorado Law School; the University of La Verne College of Law; Rutgers School of Law, Newark; Syracuse University College of Law; while twelve law schools increased in the double digits, with the University of the District of Columbia David A. Clarke School of Law increasing by 19 percent, leaving it still as the lowest tuition in the country at $11,265. One strategy law schools have been using is what University of St. Thomas School of Law professor Jerome Organ calls “Reverse Robin Hood.” Between 2006 and 2011, tuition increased an average of 36 percent, and scholarships grew 45 percent. He notes a tendency for the lowest credentialed students to pay the tuition that will finance the scholarships of the higher credentialed student. Whether tuition has been fair, law deans may have little choice. The U.S. News ranks law schools in part on how much they spend per student. 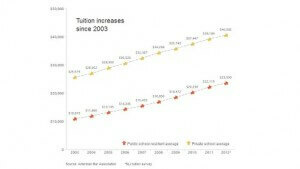 Lower tuition means lower rankings.